The O’Neill Coldwater Classic Tasmania runs March 23 - 28 in the northwest corner of Tasmania. Stu Kennedy surfs in the round of 144 Ht 10. Stephen Walsh is in Ht 13 , James Wood is in Ht 14 and Anthony Walsh starts in ht 16. Good luck fellahs. Stu had a great heat and easily progressed into the round of 96. Walshy took a while to get used to the cold but produced some heat in the end with a big win. Woody scraped thru a tight, low scoring heat to join the fellahs in the next round. A good day for the Le-Ba surfers. Stu left the other fellahs fighting for second in a dominating display today. With wave scores of 8.00 and 6.50 Stu is keeping everything on track for a big result. Woody also cracked the top 24 with a 2nd in his heat and is looking really good as we head into the pointy end of the competition. In the next round Stuey is in Ht 3 and Woody isin Ht 6. Good luck fellahs. Stuey had another solid heat win and moved into the final 16.Woody took a while to get going but produced the goods in the end and joined Stu in the next round. In his round of 16 heat Stuey went to work and showed his competitive experience to eliminate the Brazilian national champ. Woody made a really strong start to his round of 16 heat but just couldn't find a second score and finished in 9th scoring 949 valuable ratings points. Good on ya Woody, that's a keeper mate. 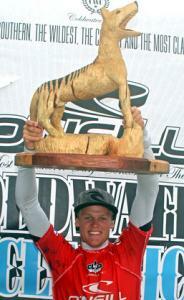 Stu Kennedy has won the O'Neill CWC Tasmania 2010. After a tough quarter and an even closer semi Stu went fully ballistic in the final and destroyed poor old Wiggolly. At the start of the final Stu had a couple of short low scoring waves but he blew the final up with a wave that had everything in the judging criteria and scored a 9.50. He backed that up with an 8.50 to get the highest heat total of the event and combo Wiggolly back to Rio. Congratulations Stuey, love ya work mate. The 3000 points that come with this victory should push Stu up to around 28th on the one world ranking. Stu will go from Tassie to the Rip Curl Pro at Bells to compete as a wildcard. Good luck grom.